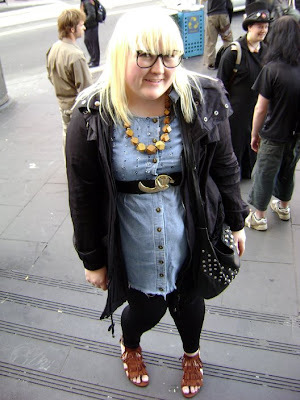 Today I met the uber cool and stylish Nakkiah from the new blog Hip Apocalyptic which you all should check out cos its great. She hails from Sydney but is down in Melbourne for the week so I showed her around the city, shopping all day and trying on way too expensive, but so cool dresses at Alpha 60. I love her gladiator sandals and leather jacket. Her Melbourne based boyfriend is so cute hey? Henry wants his jacket. I didn't tell you guys but last Friday I went to Petrova from Project Runway's shop Lady's Spring launch. Anyway Petrova came up to me and knew my name and had read my blog post about loving her on the show. So cool when people I love and respect read this blog. 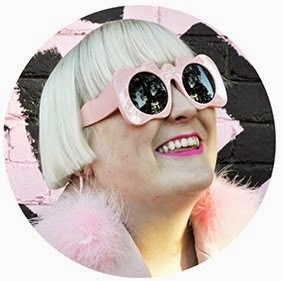 The photos from that event will be on Melbourne Street Fashion.com ASAP, as soon as they go up I'll let you know because Petrova looks AMAZING! I must be the only person who doesn't like petrova's designs. i just find them all over the place and too gimmicky. You guys look fabulous, and like you had a ton of fun! Oh who will you meet from PR next Miss Fashion Hayley?! Love you and Kia rocking the nerd-glasses! Looks like a fun day. wow! that's awesome that she read your blog! so i love how you're all so fashionable. i love your fringe sandals and also Kia's ! Lol you too look like the same person almost. Oh my GOSH I can't believe you met Petrova! haha. If I knew she even looked at my blog I'd be flippin' out! haha...mabe I'll do artwork for her someday. That would be a dream comem true! Hannah. Thanks so much for the tip about the sale, we just bought our flights for $700 YAY!!! 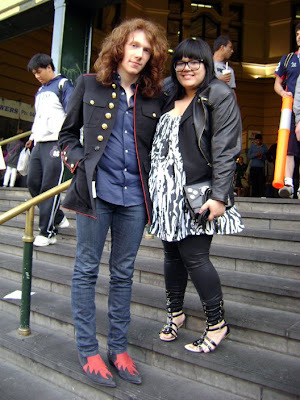 You guys all look super stylish ) I especially love Kia's boyfriend's boots! Very cool that Petrova read your blog as well. I really loved some of her pieces on Project Runway. kia's bf's jacket is so cool. everyone in this post looks suuper stylish. OMG...did she steal your look???? ?